Filled with some of the tastiest, trendiest, and most nutritious superberries – acai berries, strawberries, and blueberries – the Antioxidant Berry Blend is rich, fruity, and loaded with, as the name indicates, good-for-you antioxidants. This superberry bowl is a wonderful treat for the kiddos and the adults alike – trust us, it’s super delicious! Topped with our Signature homemade, gluten-free granola, chia seeds, and delicious fresh fruit, what’s not to love? The Antioxidant Berry Blend is an antioxidant powerhouse, supplying us with strong immune-boosting, brain-powering, beautifying, and detoxifying benefits. When consuming this delicious blend, you will, in fact, flush your system with heaps of vitamins, minerals, and other phytonutrient antioxidants. Our nutrient-dense Superberry Bowl, Green Vitality is just as its name suggests. With the addition of spinach and kale, this bowl is exploding with tons of vitamins, minerals and other energizing nutrients. Don’t let its green appearance scare you! Fear not! The fruit in this bowl make it a meal that is sweet and fruity. A wonderful (and sneaky) way of loading up on your greens. The Green Vitality is rich in antioxidant berries like all of our other superberry bowls; however, there's an added nutrient-dense twist thanks to its rich spinach and kale content. This bowl is a strong detoxifier that's rich in chlorophyll, helping to oxygenate the blood and enables the release of toxins from the body. Additionally, like all of our other leafy greens, spinach and kale is rich in vitamin K, C, and A, supplying our bodies with a multitude of health benefits, including but not limited to, promoting healthy bones, skin, eyes, and immune systems! Here is a definite customer favorite! Equally creamy and filling, this peanut-buttery and chocolate Superberry Bowl is running on all cylinders of deliciousness. PB No J soothes your sweet tooth, packs powerful antioxidants, and is strangely reminiscent of peanut butter cups. But don’t be fooled by it’s deliciousness, this bowl is also nutrient-dense and one of our most protein-dense bowl on the menu. What’s not to love about that!?! The PB No J bowl is healthy, nutrient-dense, and makes for a perfect pre or post-workout treat! It’s packed with protein and heart-healthy fats as well as antioxidant flavonoids, potassium, and magnesium. Fill up and build lean muscle with this delicious blend of peanut butter, bananas, cacao nibs and super berries – trust us, you’ll be happy you did! Say hello to our most nutrient-dense superberry bowl! Our PRO bowl is nothing short of a powerhouse for your health. You will find heaping amounts of vitamin K, A, & C from the leafy greens, antioxidants from the berries, healthy fats from the avocado and almond butter, and lots of omega-3’s from the hemp seeds. Rich, creamy, and velvety smooth, you won’t regret saying yes to going PRO! Almost every ingredient that the PRO bowl contains brings a punch of nutrients. You will find heaping amounts of Vitamin K, A, & C. Lots of antioxidants, healthy fats, omega-3's, iron, magnesium, fiber, and of course PROtein all in one meal! The star player in this bowl is, you guessed it, Maca! A root vegetable that comes from the broccoli family, it is a healing superfood that has been used for centuries for hormonal balance, stamina, mental focus, and more! Blended with antioxidant-rich berries, this delicious combination gives your taste buds a rich, sweet, and nutty flavor! There's a reason Maca been used for centuries in South American cultures. Rich in fiber, protein, vitamin C, and iron, Maca provides your body with significant amounts of superfood nutrients! 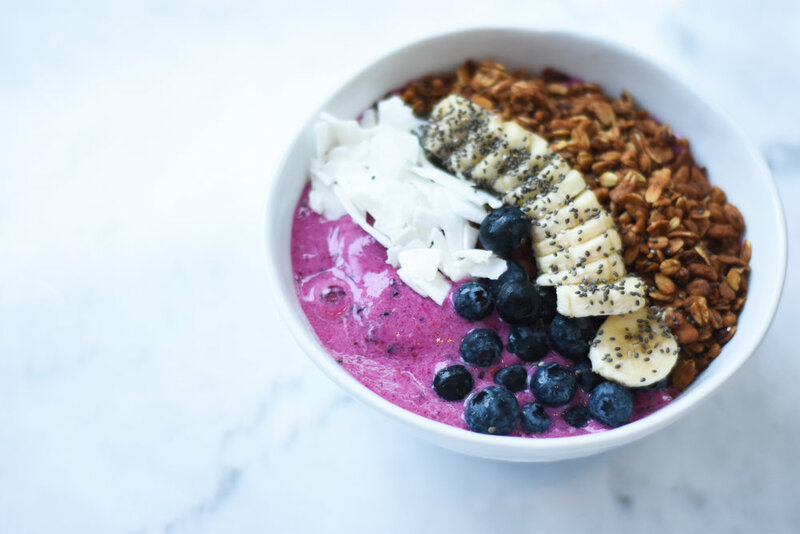 You will also find heart-healthy antioxidants thanks to the sweet pitaya, blueberries, & strawberries as well as generous amounts of omega-3's from the chia seeds. This superberry bowl is sure to give your body a hefty energy boost!